Maurizio Baiata (Italy) was born in 1951. He is an investigative reporter, UFO researcher and video producer, Rome resident. Baiata started his editorial activity decades ago as journalist and editor for Rock and Roll Italian publications, reaching the peak of his career as Editor in chief of the Italian edition of the prestigious U.S. magazine "Rolling Stone"' (1978-80). In 1981 he moved to New York, working as radio correspondent for the Italian state network RAI, subsequently becoming editor-cultural page of the daily newspaper "Il Progresso Italo Americano." Seven years later, back in Italy, Baiata concentrated his professional interest on UFO research, focusing on the Roswell incident. He produced several documentaries, with large diffusion through all media (Video, TV, magazines). The release of the Santilli Footage in Italy is due to him. Between the years 1995-2000 Baiata has directed and managed four famous UFO magazines: "Notiziario UFO", "UFO Network", "Dossier Alieni" and "Stargate". He has also directed two multimedial encyclopedias: "UFO Dossier X" (Fabbri Editori) and "Stargate - Enigmi dal Cosmo" (Armando Curcio Editore). In 1997 he released through his own publishing company the book "The Day After Roswell" by Col. Philip Corso ("Il Giorno Dopo Roswell", ed. Futuro) and invited the Author in Italy twice, establishing a deep and sincere friendship. From the original manuscript of Corso’s diary "Dawn of a New Age", given to him by the Colonel, in the year 2003 Baiata released the book in Italian (Pendragon Edizioni), the first and only edition of it, worldwide. As lecturer, Baiata has participated in numerous UFO conferences all over the world, and countless TV and radio programs. Baiata was the Managing Editor of the monthly magazine "Area 51" (Hera Edizioni), circulating in Italy with very relevant results and, again, giving to the Italian UFO field a unique - exopolitical -editorial perspective. He also worked for Open Minds Production. Now he is self-employed. 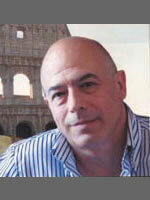 Maurizio Baiata is a member of the Advisory Board of the Exopolitics Institute.